Topicscape personal software enables organisation of your files and work in a highly visual hands-on 3D format. Using Topicscape you can present complex information, organise and prioritize your computer and combat information overload at work, at home or with your hobbies, pastimes and leisure pursuits. By creating pyramids or cones for Topics, you can build topic families – parent, child, descendants with hierarchy and associations. You can fly over your files (or pyramids) helicopter style viewing from above in 3D and zoom instantly in and out to easily navigate, organise and locate information on your computer from the 3D landscape created. 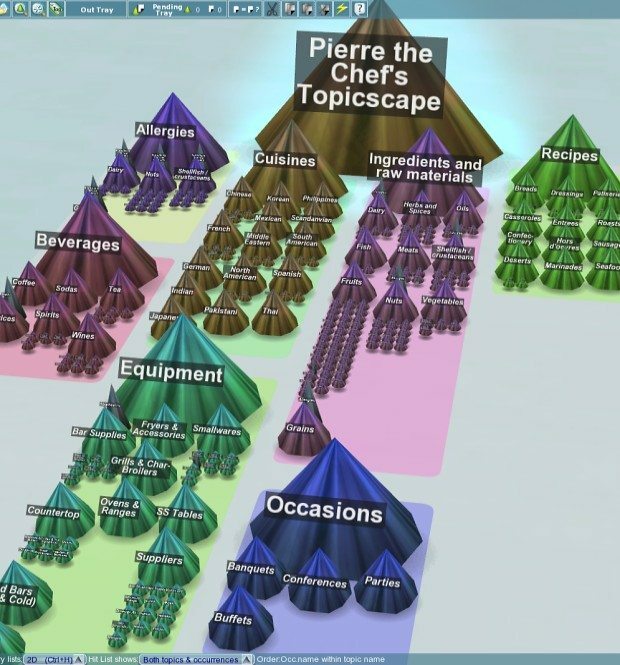 The above example from the “Users Stories” page shows how a Chef has created a 3D Topicscape overview of everything from equipment and ingredients right down to allergies and special dietary requirements – a perfect organisation and retrieval system. Files can appear in multiple places without dangerous duplication so you can have everything at your fingertips in your 3D landscape wherever you want it to appear without becoming overwhelmed or losing sight of where things are. If you buy Topicscape Pro, you can import to and export from existing Mindmapping applications so you can convert your normal 2D Mind Map and see it come to life in 3D Topicscape or present your 3D Topicscape in your normal Mind Map form. There are a variety of colours and skins to help you add a personal touch when building your Topicscapes and enabling you to categorise your files and projects even further. All the words in the world can’t describe your first dive into water as quickly and easily as taking the plunge, so if you wish to try Topicscape for yourself, create a splash and dive in now to start exploring.